Let’s Pull Together to remove weeds from the places we love! 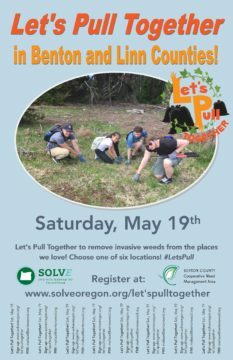 On Saturday, May 19, 2018 bring your friends, your family, your group, and join in at any one of our six Let’s Pull Together locations! Our site coordinators and on-site noxious weed experts will assist you in identifying native plants and noxious weeds. The May 19 events, taking place during Oregon’s Invasive Weed Awareness Week, are hosted by members of the Benton County Cooperative Weed Management Area (CWMA). The mission of the Benton County CWMA is to coordinate community-based efforts against those invasive species that have the potential to cause ecological and economic harm in Benton County. Benton County CWMA members hosting sites include the Alliance for Recreation and Natural Areas/Marys Peak Alliance, Benton County, Benton Soil and Water Conservation District, City of Albany, City of Corvallis, Calapooia Watershed Council, Greenbelt Land Trust, Heart of the Valley Runners, Institute for Applied Ecology, Marys River Watershed Council, Siuslaw National Forest, Sustainability Coalition Water Action Team, Willamette Mainstem Cooperative, and Willamette Restoration Volunteers. Register now to Pull Together!